Posted on February 18, 2010. Subscribe to our blog by email. Secretary Clinton will appear before the full House Committee on Foreign Affairs, for a hearing on the FY2011 International Affairs Budget and “Promoting Security through Diplomacy and Development,” on February 25. Aid advocates seem happy with the international affairs budget request, which proposes an increase of 2.8 percent over fiscal 2010, including supplemental funding. See a summary of the international affairs budget request in the Global Washington blog. The Initiative for Global Development has a new Policy Update on its website, which includes a paper written by IGD on the Business Case for Foreign Aid Reform. It also includes a letter written to Jim Jones and Larry Summers (co-chairs of the Presidential Study Directive on US Global Development Policy) recommending greater coherence between trade and aid policy. The US is a strong player back on the map, according to the Ethiopian Review. The United States is missing its opportunity to get in on the clean energy gold rush, while other countries seize the opportunity. Why Not Do for Haiti Now What We’ve Already Done for Africa? Senators Ron Wyden (D-OR) and Bill Nelson (D-FL) recently introduced legislation to improve opportunities for Haiti to export to the United States. However, the proposals being floated so far do not address the fundamental problem and still lack long-term recovery ambitions. Most experts say Haiti’s history as an aid recipient has made it a poster child for how not to administer development assistance. So it is not surprising that ordinary Haitians would be cynical about the prospects of post-earthquake aid being substantially different from the past. Despite an estimated nine billion dollars in aid over the years, Haiti remains near the bottom of global poverty and development indexes. NGOs Ask USAID: What About Non-Haiti Programs? The UN has expressed concern that the donor community–particularly the US– has forgotten about other crises and is only focused on Haiti. Kenya has lost out on more than $270 million in funding for HIV and malaria treatment from the Global Fund on Aids, TB and Malaria. Sudanese officials met with representatives of the U.S. Treasury Department’s Office of Foreign Assets Control (OFAC), World Bank, and the International Monetary Fund (IMF) to discuss $36 billion of debt relief and the possible cancellation of sanctions against Sudan. Global Washington member Agros International was featured in CATALYST Design Magazine. This article features a case study of Agros’ work in Central America, and it shows how Agros’ development model embodies the principles of a sustainable, holistic, and strategic solution to poverty. Developing country debt loads are becoming unsustainable due to IMF and World Bank lending, and this looks like déjà vu all over again. 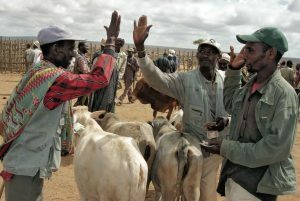 Millions Fed is a new book recently released by IFPRI (the International Food Policy Research Institute), which examines successes in agricultural development over the past 50 years. This book offers a counterpoint to criticisms of green revolution-type development programs, such as the Gates Foundation’s agricultural development program.